To have roads, houses, businesses, historical sites, emergency infrastructure mapped and available is today, for most countries, not just a luxury but a necessity. Providing important information for research and development to support ministries with climate change management, disaster response and resilience planning, for education, for business development, for cultural sustainability etc, etc. In February, a collective of Pacific islanders, GRID Pacific, working to better the situation of Pacific peoples, will begin trials and, weather permitting, will map and ‘Street View’ Rarotonga's entire road infrastructure. Director of the Global Reach Initiative Tania Wolfgramm says that “having high quality 3D imagery in Google Street View will be a positive change for the Cook Islands. Creating and publishing Street View imagery to global platforms, including Google Maps and Google Earth will open up opportunities that currently do not exist in emergency management, in tourism, business, and education and will take what currently exists to the next level”. Tania and Wikuki Kingi work to promote platforms that allow Pacific people to express their own Pacific voice. They met with Google in San Francisco whom were happy to support the initiative but, because of the Pacific region’s isolation and small populations, saw this happening in partnership with someone who was prepared and passionate enough to manage the in-country workload and expense. The GRID Cook Islands team will be working in collaboration with the Director of Emergency Management, Mr Charles Carlson, the Ministry of Tourism, and local partner Mr Stan Wolfgramm of Te Ara Cook Islands Museum of Cultural Enterprise. Tonga is located within the ‘Ring of Fire’ in the South Pacific and is vulnerable to natural disasters including tropical cyclones, flooding and storm surges, earthquakes, tsunami, volcanic eruptions, and a raft of emergencies resulting from global warming and climate change. The National Emergency Management Office (NEMO) is responsible for emergency management in the Kingdom of Tonga. GRID Tonga supports NEMO’s Mission to build the capacity of the Tonga community by developing and implementing appropriate and effective disaster risk management policies, plans and programmes to address current and emerging threats from disasters. On February 12th, 2018, Tonga was hit by Cyclone Gita, a devastating Category 4-5 tropical cyclone, destroying infrastructure, agriculture, buildings, and homes, leaving Tongatapu and its neighbouring island ‘Eua without power, little water, and compromised food supplies. 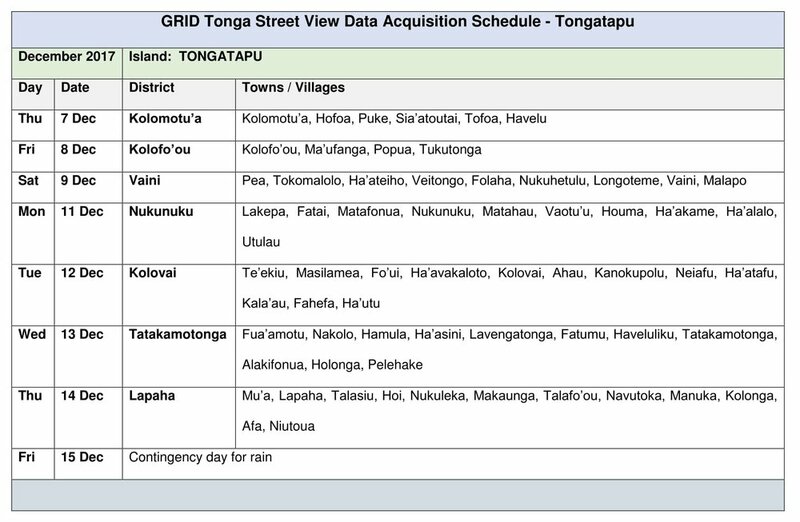 On February 14th, 2018, two days after Tonga was hit by Cyclone Gita, the GRID Tonga team returned to Tonga and acquired data and imagery across all the main roads and villages of Tongatapu. The post Cyclone Gita Street View data and imagery acquired in February 2018 also has accurate GPS location data and was provided to the Tonga National Emergency Management Office. This can be used for investigation, research, scoping, project planning, and analysis by those involved in emergency planning and management research and development, and support ministries and agencies with climate change management and disaster response and resilience. The data will also be useful for assessing the extent of damage to infrastructure (e.g. roading, power, water), buildings, and housing (e.g. pre and post cyclone), which can support the design, development, and management of recovery efforts. Starting in Tongatapu on the 6th December, the Global Reach Initiative and Development (GRID) Tonga team will be driving around Nuku’alofa and sixty-four villages across the island with special 360° cameras to add each community to Google Street View. They will record panoramic, high-resolution, three-dimensional (3D) imagery that is linked to accurate Global Positioning System (GPS) data. These images will be displayed in Google Earth and can be accessed through Google Maps as web and mobile applications. Director of the Global Reach Initiative Tania Wolfgramm says that “having 3D imagery in Google Street View will be a game changer for Tonga. Creating and publishing Street View imagery to global platforms, including Google Maps and Google Earth will open up opportunities in education, tourism, and business.” The Street View data will also provide important information for research and development, which can support ministries with climate change management and disaster response and resilience planning. While Google Street View was launched in 2007 and has panoramic views of every continent, the Kingdom of Tonga will be the first in the world to participate in the Global Reach Initiative and Development (GRID) ‘whole of country’ programme. Moreover, with Tonga’s fast broadband capability and the fibre optic cable extensions to Vava’u and Ha’apai underway, Tonga is well positioned to become a 21st century powerhouse, who can utilise Street View to create a competitive advantage across multiple sectors. The GRID Street View Team is heading to your island, town, or village - starting in Tongatapu in December! We aim to start out in Tongatapu on the 6th December, travelling across the whole island with our special Street View camera, covering Nuku'alofa and more than 70 villages over a period of several days. Weather permitting, we would love to take some 360 degree high resolutions photos of great sites including Ha'amonga, the Blow Holes, Ha'atafu, and some other sightseeing spots. Then in February and March we will head up to Ha'apai and Vava'u, and go over to 'Eua to capture data of the towns, villages, and sites on those beautiful islands. And we want to get our gear up to 'Ongo Niua for picking up Street View of the villages of Niuafo'ou and Niuatoputapu. We will let everyone know when the GRID Google Street View Car will be heading your way - and we will keep you posted with the final schedule (weather permitting). This will give you time to 'look sharp' - prepare your homestead, your village, tidy up your lawns, paint and put out your shop signs - yes, put your best foot forward and your friendliest smile on for the world! And check out our Resources page for some cool posters - feel free to download them, share them, print them - have fun! The Kingdom of Tonga will be the first country in the world to participate in the Global Reach Initiative and Development (GRID) Pacific Programme. The GRID Pacific Programme honours the vision and values of the people of Tonga, their cultural heritage and beliefs, and their passion and devotion for their wonderful kingdom. The GRID Programme includes a number of interlinked phases including 1. Vision, Scope, Design; 2. Engage, Plan, Test; 3. Activate, Data Acquisition; 4. Data Processing, Review, Publishing, LiveLaunch; and 5. Ongoing Support, Training, Capability and Capacity Building. *While some of these are offered free or at minimal cost, others have fees associated with them.